VaporSpan offers the ventilated comfort of an open-air backpanel design, with comfort improvements that make competing designs obsolete. A low profile, ultra-plush cushion in the lumbar region combines with VaporSpan’s unique leaf-spring support to conform to the lower back while allowing open airflow. EVAP wicking technology provides the same structural benefit of mesh, but with greatly improved moisture transfer for better temperature regulation. 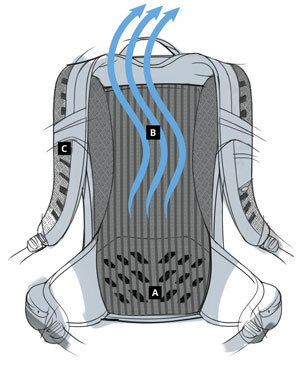 To ensure 360-degree ventilation, the VaporSpan harness features a foam matrix core that allows air to escape from beneath the shoulder straps. Uses unique leaf-spring lower back lumbar design to fit perfectly on your lower back, while keeping the ventilated backpanel low profile to maximize interior capacity. Provides incredibly cool and comfortable backpanel performance in all weather conditions.